We started working on fractions a couple weeks ago. I know that students are introduced to fractions in first grade, and are given reminders in second, but the spiral review I’ve done with our Sign In board told me that a good portion of my kids needed to go wayyyyyy back and start from scratch. As I was walking through Costco one day I saw these ginormo bags of M&M’s and knew that was exactly what I was going to use! I passed out a handful of M&M’s to each student. I didn’t count them out. I didn’t separate them into neat little cups. You get what you get and you appreciate it. Students then sorted them into colors and recorded the amounts on their recording sheet (the left column above). Then we all came together and discussed what we knew about fractions. And students then recorded their fractions on the right side of their recording sheet. Then I put students into partners to record their totals together. Each person had their own recording sheet. They could either just use the M&M’s themselves, or they could add up the amounts from the first papers. Afterwards, I combined partners into groups. The numbers got large, but it helped them practice addition skills as well. When we were done, everyone got to eat their own M&M’s. And they all thought I was the best teacher in the entire universe. The next day, we moved on to working with fractions in a shape. I cut a bunch of one-inch strips of paper in two different colors. We began by folding one strip of paper into halves, coloring in one half, and then labeling it and gluing it onto paper. Next, we folded another strip of paper into halves, and then halves again. We then found that two-fourths was the same as one half. And then we did it again to find eighths. We talked about how since we were folding it in half, the amount we had doubled because it split each piece into two. I think, maybe, a couple kids understood that. We then used the other color strips of paper and divided them into thirds, and then sixths, and then nineths. After we did the sixths, I pointed out that the dividing line lined up with the ones we had done above, but it didn’t match what we did on thirds. One of my kids suggested that it was because it was an even number. I aha’ed with joy at that. He didn’t quite understand why it worked, so I did my best to explain. But the fact that he noticed it made the windows swing open, birds start singing, and a chorus of Hallelujah started singing. Or, maybe that’s just how it went in my head. We didn’t talk about equivalent fractions at all, really. We talked about how they were the same when we shaded them. But it didn’t go beyond that. We also created anchor charts with our previous and new learning. The next day, we created another anchor as we began to compare fractions. We looked at our paper strips and used them to help us. Comparing fractions is difficult, and as much as I want the kids to understand how one fraction is bigger than another, we also need to talk about some generalizations and rules. Because I didn’t like anything from our basal for this, I looked elsewhere. This Fractions Rock unit from Ashleigh is amazing! It’s really helped me beef up my ideas and make sure I’m covering all aspects of the standards. It’s HUGE with a ton of different ideas. I wish I had remembered to take pictures some of the other days so I could share what we did. Click on either of the pictures to go to Ashleigh’s blog and see a little bit more about the unit and get a link to purchase it. It’s amazing!We’re wrapping up fractions this week. We need to cover a bit on decimals, which terrify me. 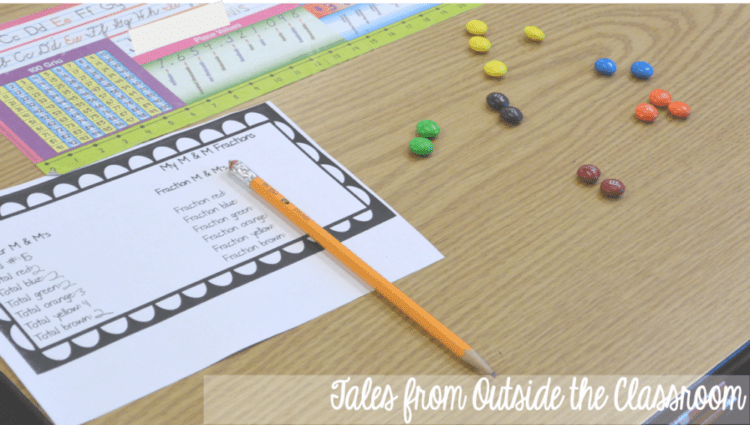 Do you have any great ideas for teaching fractions or decimals? I love how you built the concept up and then when you did the highly motivating food part, you kept increasing the cooperation. My school doesn't allow any food to be used but I am downloading this and keeping it as either an example or a someday. Thanks so much!